Cherry Walker was a devoted, trusting, an uncommonly innocent young woman who loved caring for a neighbor’s little boy. But when she was asked to testify in court against his abusive mother, Cherry never got the chance. She couldn’t lie if her life depended on it–and it did. Cherry’s body was found on the side of a Texas road, after being doused with lighter fluid and set aflame. Attractive, manipulative, and violent, mother of four Kim Cargill had a wealth of dirty secrets she’d do anything to keep hidden. This in-depth account by bestselling investigative journalist M. William Phelps takes you inside Cargill’s shocking trial–and into the mind of one of the most conniving female psychopaths in recent history–and on death row. I used to read a lot of true crime when I was in my teens/early 20’s. I had books on Ted Bundy, Charles Manson, the Son of Sam and other lesser known killers. It was somewhat of an obsession of mine to read these types of books. I was obsessed with the psychological aspect. I wanted to know what made these killers do what they did and what was that breaking point where they resorted to killing. I stopped reading true crime when an ex-boyfriend of mine made a flip comment about my collection one day….which resulted in my donating all of my books (awful, I know :() But, my fascination continued. I watch ID and Snapped all the time. BK has made the comment that I probably know more than the police when it comes to this stuff. 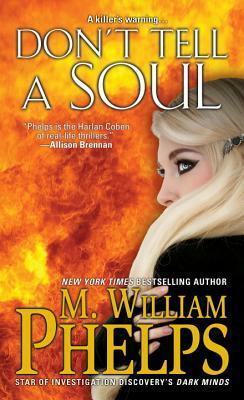 So, when Kensington approached me to review Don’t Tell a Soul, I jumped at the chance….even though it was not the usual genre that I review. This book gave me chills because KC was such an evil person. I mean, you would have to be to kill someone and then light them on fire, trying to hide their identity. Even before that, she was just a bad person. She abused and terrorized her children, abused and terrorized her husband and basically anyone that came within her radar and didn’t give her what she wanted. She manipulated people into doing things (like her friend who tampered with evidence). She had no sense of remorse for anything she did….including Cherry’s murder. Like I said above, the psychological aspect of this book was fascinating for me to read. Could KC have turned out to be a better person if she got the psychological help that she needed? I don’t know. There are arguments about people like her. Some people say they are born that way (genetic) and others say that environment creates these monsters. My opinion is that it is a combination of both. I am going to end this post saying that Cherry’s murder was a senseless one and that I hope her parents get some sort of closure when KC is put to death. While these types of reviews are supposed to be impartial, I connected with Cherry through what the author wrote about her. She was one of those rare innocent people whose light got extinguished well before her time. Why: I couldn’t put this book down, even though KC scared me. This isn’t a book for those who have weak stomachs though. There are some pretty graphic descriptions of Cherry’s body and child/spousal abuse.